Traditional morphological and biological species concepts are difficult to apply to closely related, asexual taxa because of the lack of an active sexual phase and paucity of morphological characters. Phylogenetic species concepts such as genealogical concordance phylogenetic species recognition (GCPSR) have been extensively used; however, methods that incorporate gene tree uncertainty into species recognition may more accurately and objectively delineate species. Using a worldwide sample of Alternaria alternata sensu lato, causal agent of citrus brown spot, the evolutionary histories of four nuclear loci including an endo-polygalacturonase gene, two anonymous loci, and one microsatellite flanking region were estimated using the coalescent. Species boundaries were estimated using several approaches including those that incorporate uncertainty in gene genealogies when lineage sorting and non-reciprocal monophyly of gene trees is common. Coalescent analyses revealed three phylogenetic lineages strongly influenced by incomplete lineage sorting and recombination. Divergence of the citrus 2 lineage from the citrus 1 and citrus 3 lineages was supported at most loci. A consensus of species tree estimation methods supported two species of Alternaria causing citrus brown spot worldwide. Based on substitution rates at the endo-polygalacturonase locus, divergence of the citrus 2 and the 1 and 3 lineages was estimated to have occurred at least 5, 400 years before present, predating the human-mediated movement of citrus and associated pathogens out of SE Asia. The number of Alternaria species identified as causing brown spot of citrus worldwide using morphological criteria has been overestimated. Little support was found for most of these morphospecies using quantitative species recognition approaches. Correct species delimitation of plant-pathogenic fungi is critical for understanding the evolution of pathogenicity, introductions of pathogens to new areas, and for regulating the movement of pathogens to enforce quarantines. This research shows that multilocus phylogenetic methods that allow for recombination and incomplete lineage sorting can be useful for the quantitative delimitation of asexual species that are morphologically indistinguishable. Two phylogenetic species of Alternaria were identified as causing citrus brown spot worldwide. Further research is needed to determine how these species were introduced worldwide, how they differ phenotypically and how these species are maintained. The delimitation of species and evolutionary relationships among them is fundamental to biology. However, the application of species concepts to putatively asexual taxa can be difficult and controversial [1, 2]. Not all species concepts can be applied to asexual species, and some researchers have even suggested that asexual lineages do not represent species at all . For example, the morphological species concept (MSC) or biological species concept (BSC) may not be adequate for delineating asexual fungi [2, 4, 5] especially where morphological differences are not observed. However, any new allele conferring an adaptive advantage to an asexual organism in a particular ecological niche may be selected. Selective pressure on that gene is expected to affect the entire genome through genetic hitchhiking thus having the potential to rapidly form a new cryptic species . These discrete entities may be recognized as species rather than as part of continuous distribution of phenotypes. Asexual taxa are also expected to diverge into discrete lineages under processes such as divergent selection and/or geographic isolation . To date, the systematics of asexual fungi has relied heavily on phylogenetic approaches to study cryptic speciation among closely related taxa [5–7]. In asexual fungi, phylogenetic species concepts can identify phylogenetically distinct lineages with the implication that new species have formed that are not yet morphologically distinct . These methods most often involve the concatenation of sequence alignments, using methods such as the genealogical concordance phylogenetic species recognition (GCPSR) which is an operational criterion for species recognition [2, 9]. The GCPSR focuses on species identification through multi-gene genealogies and reciprocal monophyly to identify fungal species . This method has applicability for both asexual and sexual lineages and species boundaries are estimated by concordant clades of multi-gene genealogies. The absence of monophyly and conflict among the multiple gene trees identifies species limits for taxa . However, species boundaries of closely related taxa, in the initial stages of divergence, can be difficult to ascertain using multilocus phylogenetic methods because gene trees of recently diverged taxa can differ substantially in their evolutionary histories . Processes such as incomplete lineage sorting, recombination, and horizontal transfer can cause discord among gene and species trees, masking true evolutionary relationships among closely related taxa . Incongruence, in itself, can signal possible recombination, reticulation, and incomplete lineage sorting. Individual gene trees may have different evolutionary histories [12, 13] which limits the accuracy of species tree estimation using concatenation of loci . Incomplete lineage sorting is caused when ancestral polymorphisms persist through speciation events and each ancestral polymorphism can lead to different alleles carried among descendants [14, 15]. Coalescent-based methods, which stochastically join sampled gene lineages as they are followed back in time, have been developed to incorporate lineage sorting and the presence of incongruent genomic regions into phylogenetic estimation procedures [16–18], even in the presence of lineage sorting and lack of reciprocal monophyly at any single locus . Coalescent methods have recently been used to assess species trees for a range of taxa including sexually reproducing species such as the Tennessee cave salamanders (Gyrinophilus; ), tropical lowland birds (Manacus; ), grasshoppers (Melanoplus; ), and rice . Few researchers, however, have examined the utility of these methods for closely related asexual taxa that are morphologically indistinguishable . Phylogenetic analyses of closely-related taxa, such as rice , Drosophila, and cryptic fungal species, such as Penicillium[22, 24], are at the intersection of population genetics and phylogenetics where the effects of coalescent stochasticity results in high levels of gene tree incongruence [17, 25–27]. Estimating species trees for these taxa can be problematic; these methods could prove to be useful for closely-related asexual fungal taxa. The putatively asexual citrus pathogen, Alternaria alternata, provides an ideal case study for the application of quantitative species recognition using species tree estimation methods that incorporate uncertainty in gene trees. Andrew et al. developed a species phylogeny for small-spored Alternaria using four genomic regions including a protein coding gene and three anonymous, non-coding regions. Significant incongruence was found among gene genealogies and several putative recombination events were identified within two of the non-coding regions indicating divergent evolutionary histories among the loci . Hypotheses to explain this incongruence included recombination and incomplete lineage sorting. A recent study of the mating system of A. alternata causing brown spot in Florida found signatures of recombination  but studies of the larger worldwide population of the pathogen are lacking. Currently, there is a large discord between the number of morphological and phylogenetic species that are thought to cause citrus brown spot. The fungus infects tangerines and mandarins (Citrus reticulata Blanco) and tangerine x grapefruit (C. reticulata x C. paradisi Macfad.) hybrids worldwide. When first reported in Australia , the pathogen was identified as A. citri Ellis & N. Pierce due to its morphological similarity to the causal agent of a postharvest disease, citrus black rot. Since this time, the pathogen has been referred to as A. alternata ‘tangerine pathotype’ based on morphological similarity to A. alternata[31–33]. Further, molecular comparisons were performed using restriction fragment length polymorphisms (RFLPs) of the nuclear ribosomal DNA (internal transcribed spacer region, ITS) among 11 closely related, small-spored Alternaria taxa. Results from this study showed that morphologically similar Alternaria species collected from different hosts and that produce host specific toxins shared common RFLP fingerprints and identical ITS sequences, leading the authors to conclude that Alternaria fungi known to produce host-specific toxins are intraspecific variants of A. alternata specialized in host pathogenicity . Ten new Alternaria species have been described from citrus hosts  and phylogenetic studies have attempted to map these morphospecies onto phylogenies estimated from molecular data. Using a worldwide sample of isolates, Peever et al. [35, 36] and Andrew et al. evaluated these morphospecies using phylogenetic criteria and found three distinct lineages (labeled Clades 1, 2 and 3 in ). Two of these lineages were found in Florida (Clades 1 and 2), whereas the third lineage occurred only in Turkey, Israel, Australia and South Africa (Clade 3). These three worldwide lineages corresponded to several morphospecies including A. citriarbusti (Clade 1), A. tangelonis and A. colombiana (Clade 2), and A. dumosa, A. turkisafria, A. perangusta and A. interrupta (Clade 3) . Peever et al. further tested the concordance between the 10 citrus-associated morphospecies  on citrus using a broader range of isolates. Peever et al. found eight distinct Alternaria clades from citrus hosts that could be interpreted as phylogenetic species under the GCPSR concept. This incongruence between the number of species defined using morphological and phylogenetic criteria raises significant questions about the number of Alternaria taxa that cause brown spot disease. Coalescent analyses of gene geneaolgies, which describes descendent/ancestor relationships where the gene of interest undergoes coalescence to a common ancestor, can be used to examine the evolutionary history of a gene backwards in time and can be used to incorporate incomplete lineage sorting into phylogenetic analyses . Currently, there is a lack of agreement among researchers about how many Alternaria species cause citrus brown spot, ranging from as many as 10 species to as little as 1 species. The main objective of this study was to quantitatively estimate the number of species of Alternaria causing citrus brown spot on a worldwide scale utilizing newly developed methods that incorporate the coalescent and account for recombination or incomplete lineage sorting. 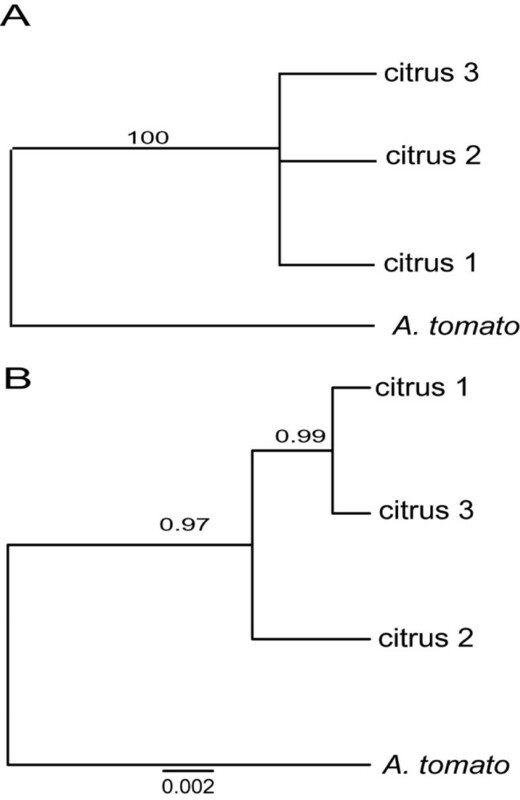 The evolutionary histories and recombination of known genetically distinct lineages, citrus 1, citrus 2 and citrus 3 were evaluated from a larger worldwide sample of A. alternata tangerine pathotype and more loci in order to establish species boundaries of these previously observed phylogenetic lineages using gene sequence concatenation methods and several approaches that incorporate uncertainty in gene genealogies when lineage sorting and non-reciprocal monophyly of gene trees is common. One hundred and forty two isolates were collected from brown spot lesions on cultivars of tangerines, mandarins (Citrus reticulata Blanco) and tangerine x grapefruit hybrids [C. reticulata x C. paradise (Macfad.)] in 12 countries, including Argentina (AR), Australia (AU), Brazil (BZ), Colombia (CB), Greece (GR), Iran (IR), Israel (IS), Italy (IT), Peru (PE), Spain (SP), Turkey (TU), and USA (FL). Sixty-five of these isolates from Australia, Colombia, Israel, South Africa, and United States overlapped with a previous study (; Figure 1A, Additional file 1: Table S1). Isolates from Argentina, Australia, Brazil, Colombia, Greece, Iran, Israel, Italy, Peru, Spain, Turkey, and USA were sampled from tangerine hybrids in several geographically separated citrus groves within each country. Australian isolates were collected from tangerine hybrids in the Narara arboretum (Narara, New South Wales), and isolates from Florida, USA were collected from a small area (2,500 m2) in a single grove of Minneola tangelo [35, 36, 38]. A. Geographic origin of Alternaria alternata sampled from citrus in 12 countries (small black circles). The numbers of isolates sampled from each country are in parentheses. The pie chart for each country represents the number of endoPG haplotypes with each color denoting a different endoPG haplotype [(Hap1 (Fuschia), Hap2 (orange), Hap3 (blue), Hap4 (dark blue), Hap5 (red), Hap6 (maroon), Hap7 (yellow), Hap8 (green), Hap9 (pink), Hap10 (light pink), Hap11 (brown), Hap12 (purple), and Hap13 (light yellow)]. B. An endo-polygalacturonase (endoPG) phylogeny estimated among a worldwide sample of citrus brown spot isolates using Bayesian inference with A. tomato as an outgroup. Three phylogenetic lineages identified correspond to Clades 1, 2, and 3 of Peever et al. . Node support is given as posterior probabilities and bootstrap values based on Bayesian and likelihood analyses. Fungi were cultivated in potato dextrose broth (FisherSci, Pittsburg, PA) for 5–7 days at room temperature on an orbital shaker at 150 rpm. Genomic DNA was extracted from powdered, lyophilized mycelium following the methods of Peever et al. , using either a Qiagen DNeasy Kit or a Phenol-Chloroform procedure. Extracted DNA was quantified using a Nanodrop1000 (NanoDrop products, Wilmington, DE, USA), and a total of 30 ng was used as template for PCR. Isolates were maintained in long-term storage on sterilized filter paper at −20°C as previously described . Each isolate was sequenced at the endo-polygalacturonase locus  using primers and conditions similar to those used by Peever et al. [35, 36, 40] and Andrew et al. . This region has been extensively used because other commonly used genomic regions, such as ribosomal regions, mitochondrial large and small subunits, and the beta-tubulin gene, show little variation among Alternaria isolates collected from citrus . Amplified products were visualized in 2% ethidium bromide-stained agarose gels. Amplified DNA fragments were sequenced directly on both strands following treatment with EXOSAP-IT (USB, Cleveland, OH) using the Big Dye terminator kit (Applied Biosystems, Foster City, CA). Sequence reads were performed on either a PE Biosystems model 3700 automated DNA Sequencer by the Laboratory for Biotechnology and Bioinformatics at Washington State University, Pullman, WA or at Elim Biopharmaceuticals, Inc, Wayward, CA. A subset of isolates with unique endoPG haplotypes representing each sampled location (n = 34) was selected for additional sequencing and analyses. Additional loci included two anonymous, non-coding SCAR markers OPA1-3 and OPA2-1 , and one non-coding microsatellite flanking region Flank-F3. Loci OPA1-3 and OPA2-1 were previously used for phylogenetic studies of small-spored A. alternata[36, 42]. Amplification and sequencing conditions were as previously reported [28, 36, 40, 42]. Clone sequences containing microsatellites  were downloaded from GenBank [accession: DQ272483 to DQ272487], and primers were designed to amplify the microsatellite flanking regions using Primer 3 . Primer sequences for AA-Flank-F3 were (Flank3F-5′-AGCCAAAACACGTTGATACC-3′/ Flank3R-5′ ATCCGCAGCGAAAAGAACT-′3). Twenty microliter PCR reaction mixtures contained 20 ng genomic DNA, 1 × PCR buffer (New England Biolabs (NEB), Ipswich, MA), 4 nmol of each dNTP (NEB), 50 pmol primer, and 1U of Taq polymerase (NEB). Cycling conditions consisted of denaturation at 94°C for 4 min; 44 cycles of 94°C for 1 min, 55°C for 30 sec, and 72°C for 2 min; final extension was at 72°C for 7 min depending on the optimal conditions for each primer set. Each locus was analyzed independently. Maximum likelihood and Bayesian phylogenetic analyses were performed for each locus using PhyML  and MrBayes 3.0 . DT-ModSel  was used to estimate the nucleotide substitution models best representing each dataset. An Kimura K80 model was selected for the endoPG (base frequencies = equal; transversion = 5.29; proportion of variable sites = 0), and OPA2-1 (base frequencies = equal; transversion ratio = 5.52; proportion of variable sites = 0). The Kimura K80 model with proportion of invariable sites was selected for OPA1-3 (base frequencies = equal; tratio = 1.47; proportion of variable sites = 0). The Jukes Cantor 69 model was selected for Flank-F3 (base frequencies = equal; proportion of variable sites = 0). Maximum likelihood analyses were performed under the heuristic search with TBR branch-swapping, and bootstrap support was estimated using 1000 pseudoreplicates. For Bayesian analyses, Metropolis-coupled Markov chain Monte Carlo searches included 2 runs with four chains each run for 3,000,000 generations and ensuring that the average split frequencies between the runs was less than 1%. Trees were sampled every 200 generations. Each run generated 60,001 trees of which the first 18,000 trees (30% of the total number of generations) were discarded as “burnin”, as visually determined by evaluating log files in TRACER version 1.5 . In order to test topology congruence among phylogenies from different loci, the Shimodaira-Hasegawa (SH) test of topological congruence  was conducted on the Bayesian phylogenies as implemented in PAUP*10_4b  with 1000 RELL resampling replicates. Ancestral histories of the citrus brown spot lineages were estimated using the coalescent [37, 45]. Sequence data were aligned and edited manually by eye and using clustalW implemented in BioEdit v7.0.53 for Windows . Isolates were assigned to haplotypes using DnaSP v 5.1 [52, 53]. To verify the suitability of each locus for coalescent analyses, the neutrality of each locus was estimated using Fu and Li’s D and Tajima’s D and potential recombination within each locus was examined using Rmin  as implemented in DnaSP. Incompatibility matrices  were estimated in SNAP Clade and SNAP Matrix as implemented in SNAP workbench  to visualize incompatible nucleotide sites, such as those arising from recombination or recurrent mutation. Sequences were collapsed into unique haplotypes using SNAP map  and SITES version 1.1  by removing indels and incompatible sites. Evolutionary histories were simulated using coalescent analyses for each locus. Two loci Flank-3 and OPA1-3 showed evidence for recombination and therefore coalescent analyses for all genomic regions were implemented using recom version 5.8 (within SNAP workbench), which allows for coalescent analyses with recombination, assuming the infinite-sites model, neutral evolution, panmixia and constant population size . Using a haploid coalescent model, recom5.8 estimates population recombination rate, ρ, (2Ner) and mutation rate, θ (2Neμ). These estimates were then used to obtain estimates of the number of recombination events and the time to the most recent common ancestor (TMRCA). For all analyses, the ancestral state of each segregating site was estimated by comparing each site to that of A. tomato isolate BMP2031 . Sites which had ambiguous ancestral states were removed from the datasets. OPA1-3 had five sites (205, 230, 301, 382, and 436) with three states and one site (349) with four states, and the endoPG had one site (346) with three states. Coalescent analyses were performed in SNAP workbench , with five independent runs (1 million simulations each) per genomic region to ensure convergence for each parameter estimate. Conditions were switched to + b for genomic region OPA1-3, which aborts low probability paths and returns to zero. Gene geneaologies and minimal recombination graphs (ARGs) were constructed to graphically represent the evolutionary history of the citrus lineages estimated by the coalescent. No putative recombination events were detected within endoPG and OPA2-1. Genetree , which assumes coalescent analyses without recombination, was used to estimate the coalescent gene genealogies for these regions and compared to the recom5.8 results. Five independent simulations with 1 million runs each were conducted on haplotypes of each region to estimate the ages of mutations and the TMRCA, as inferred by an A. tomato rooted tree, to assess convergence. A graph of the tree was generated with coalescent unit times using Treepic . An ancestral recombination graph (ARG) can be used to visualize a recombining coalescent history that cannot be displayed using a bifurcating tree . The ancestral history of the recombining OPA1-3 and Flank-F3 haplotypes were reconstructed using a parsimony approach that accounts for both mutation and recombination backwards in time. Beagle  was used to produce an ARG for Flank-F3, whereas kwarg was used for OPA1-3 . Beagle computes minimum recombination histories with an exhaustive approach. Kwarg, on the other hand, implements a heuristic search for plausible histories and does not guarantee the minimal recombination history. Beagle was run for both genomic regions, however due to the increased complexity and putative number of recombination events within OPA1-3, each trial run crashed. Four methods were used to estimate species trees among the four gene trees. These included concatenation, genealogical concordance phylogenetic species recognition (GCPSR; ), minimizing deep coalescence (MDC; [14, 17, 64]), and a mixture of coalescent and the Yule process (*BEAST) . For MDC and *BEAST, taxa are required to be assigned to species a priori. Therefore, taxa were assigned to species based on identified endoPG clades (citrus 1, citrus 2, and citrus 3, Additional file 1: Table S1). A phylogeny of the concatenated dataset was implemented in MrBayes. Loci were partitioned and the previously estimated evolutionary models were used for Bayesian analyses. Metropolis-coupled Markov chain Monte Carlo searches included 2 runs with four chains each run for 3,000,000 generations and ensuring that the average split frequencies between the runs was less than 1%. Each run generated 60,001 trees of which the first 18,000 trees (30% of the total number of generations) were discarded as “burnin”. GCPSR identifies species boundaries by comparing multiple gene trees among the same set of taxa [5, 65]. Putative species are identified when representatives of a species formed well-supported clades (95 posterior probability/70 bootstrap) in all gene trees . Bayesian and likelihood tree searches were used to estimate species within the citrus brown spot worldwide population according to GCPSR criteria. The MDC approach assumes that discordance of gene trees is the result of incomplete lineage sorting [14, 17]. The deep coalescence measure is a count of the number of extra gene lineages that result from fitting a gene tree into a species tree, thereby summing the extra gene lineages as a measure of discordance. MDC then searches for a species tree by minimizing the number of deep coalescences across loci. MDC analysis was implemented in Mesquite v2.73 . Gene tree uncertainty was accommodated into species tree inference by resampling (500 times) the posterior probability of tree topologies obtained from the Bayesian phylogenetic analyses using the Mesquite software module AUGIST . To fit the gene trees into a species tree that minimized the number of deep coalescence across loci, gene trees were considered rooted (A. tomato as the root) and a heuristic search utilizing subtree pruning and re-grafting was used. All equally parsimonious species trees were retained, and a 50% majority-rule consensus tree was generated. Biparition frequencies for nodes were used as measures of species tree uncertainty. *BEAST generates posterior samples by simultaneously estimating gene and species trees under a hierarchical coalescent model while allowing for independent evolutionary processes in each genomic region. BEAUTi version 1.7.5  was used to create XML-formatted input files for *BEAST v1.7.5. Substitution models were chosen as previously described and were unlinked across genes with parameters estimated separately for each gene. As a needed prior in *BEAST, isolates were assigned to species groups under the Traits tab based on the three clades identified in the endoPG phylogeny. Evolutionary rates were estimated under a Yule process . A Yule model was chosen as the species tree prior, which assumes a constant lineage birth rate for each branch in the tree. This tree prior is most suitable for trees describing the relationships between individuals from different species and is often thought of as describing the net rate of speciation . Species tree estimations were carried out based on strict molecular clock assumption, following the methods of Heled and Drummond . Data sets were run for 50 million generations in BEAST, sampling every 5,000 generations. Analyses were performed twice. Postburnin trees were combined with the program LogCombiner (BEAST v 1.6.0), and chains were assumed to converge when the average standard deviation of split frequencies was found to be < 0.011. The maximum clade credibility tree with posterior probability of each node was computed with the program TreeAnnotator (BEAST v 1.6.0). Log files were evaluated in TRACER version 1.5 . The species tree was calculated using TreeAnnotator version 1.7.2 with a burn-in of 5000 trees. FigTree version 1.3.1  was used to visualize the consensus tree node ages, branch lengths and posterior probabilities. Alternaria alternata sampled from tangerine and tangerine hybrids on a worldwide scale (n = 142) revealed a total of 13 endoPG haplotypes (Additional file 1: Table S1, Figure 1A). 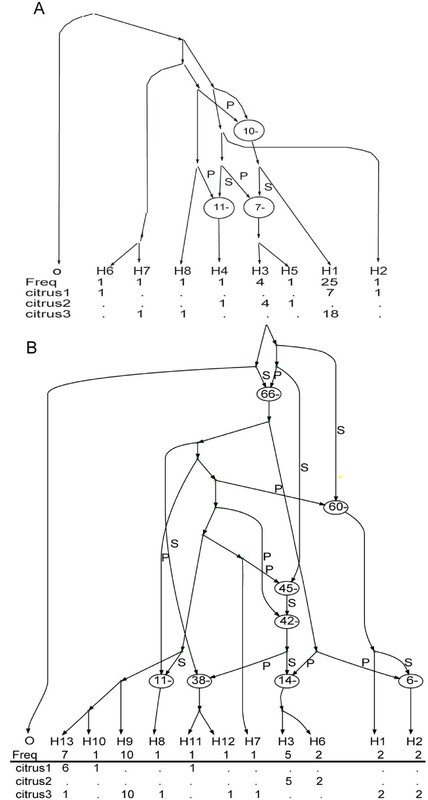 Bayesian and maximum likelihood analyses of endoPG resulted in two phylogenetic lineages using a 95 posterior probability and 70 bootstrap value criterion (Figure 1B) . These two lineages are subsequently referred to as ‘citrus 2’ and ‘citrus 3’. 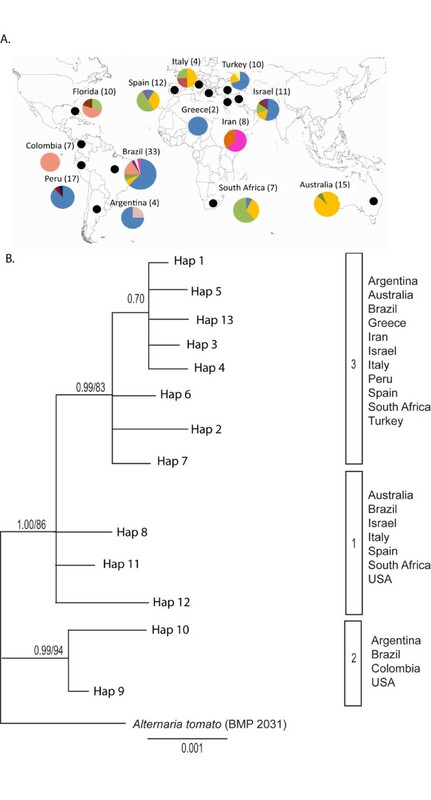 All other haplotypes (Hap8, Hap11, and Hap12) were placed into another group called citrus 1 based on previously published results that showed the existence of three lineages . Thirty-five representative isolates were selected based on unique endoPG haplotype and geographical location to resolve the ancestral histories of the lineages using coalescent-based approaches. Neutrality and intra-locus recombination rates were estimated for all the genomic regions using D (Tajima’s and Fu and Li’s) statistics and Rmin. We were unable to reject the null hypothesis of neutrality for two loci (Table 1). BNumber of polymorphic sites (informative/uninformative). CExcludes outgroup isolate, BMP2031 (A. tomato). WIncludes all isolates in the worldwide dataset (ca.142). NSNon-significant, SSignificant; P > 0.10. RNumber of recombination events estimated by Recom v. 5.8 . Coalescent-derived gene genealogies were estimated for the two non-recombining loci, endoPG and OPA2-1 (Figures 2A-B). In the endoPG genealogy, isolates of the citrus 1 lineage were positioned ancestral to all other haplotypes by several mutations (Figure 2A). In locus OPA2–1 signals of incomplete lineage sorting, where ancestral polymorphisms have not been sorted, were evident (Figure 2B). For example, some isolates from citrus 1 and citrus 3 were interspersed among identified clades, suggestive of non-reciprocal monophyly (Figure 2B). Further, little variation was revealed in the OPA2-1 genealogy, but eleven mutations, respectively, separated the A. alternata lineages from the A. tomato outgroup. Isolates from all lineages shared haplotypes, such that isolates from lineages citrus 1 and 3 formed a paraphyletic group. This was also observed in the OPA2-1, where haplotypes D and G included isolates from lineages citrus 1 and 3. 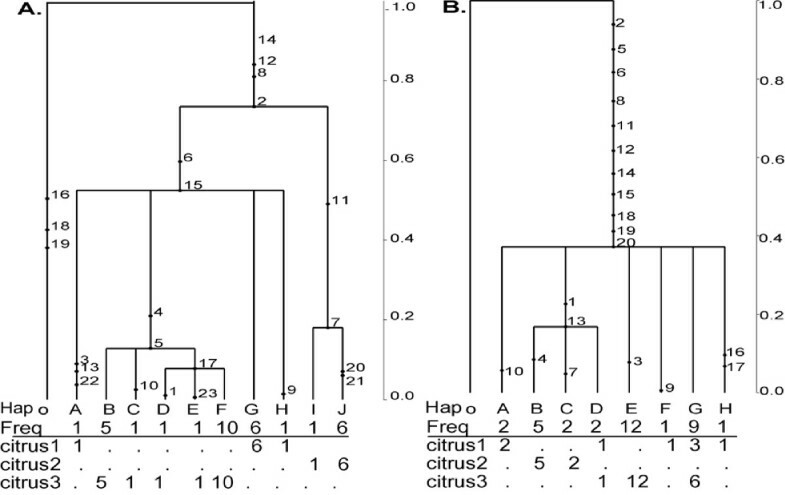 Two clusters were formed, one including isolates from citrus 1 and 3, while the other included a polytomy of haplotypes from the citrus 1 and citrus 2 lineages (Figure 2B). Coalescent-based gene genealogies estimated assuming no recombination for loci (A) EndoPG and (B) OPA2-1, with no conflicting sites. Each genealogy is scaled to TMRCA of 1 and numbers represent mutations. Each haplotype is labeled with a letter and the frequencies of each haplotype and relationship to each lineage is shown. Loci OPA1-3 and Flank-F3 had evolutionary histories of recombination. Three recombination events were observed in Flank-F3, which in all cases involved isolates from lineage citrus 1 and 2 (Figure 3A). OPA1–3 had the most complex evolutionary history involving eight recombination events (Figure 3B). These events included isolates from all three lineages suggesting possibly a sexual past as suggested by Berbee et al. . Minimal ancestral recombination graphs for loci (A) Flank-F3 and (B) OPA1-3, rooted with A. tomato . Recombination events are indicated by ovals. Recombinant sites consists of a prefix ‘P’ sequence that is concatenated with a suffix ‘S’ sequence. These designations appear on edges going into a recombination node. Numbers to the right/left of the paths are the number of mutations in that segment. The direction of the paths is from past to present. Analyses were conducted for each locus independently for 35 isolates with representative endoPG haplotypes selected from the original worldwide sample. Analysis of endoPG yielded a phylogeny with similar topology to that estimated among the total worldwide sample, supporting three clades (Figure 4A). Eight haplotypes were identified in locus OPA2-1, however no monophyly was observed in the lineages (Figure 4B). A total of 7 haplotypes were identified locus Flank-3 (Figure 4C). 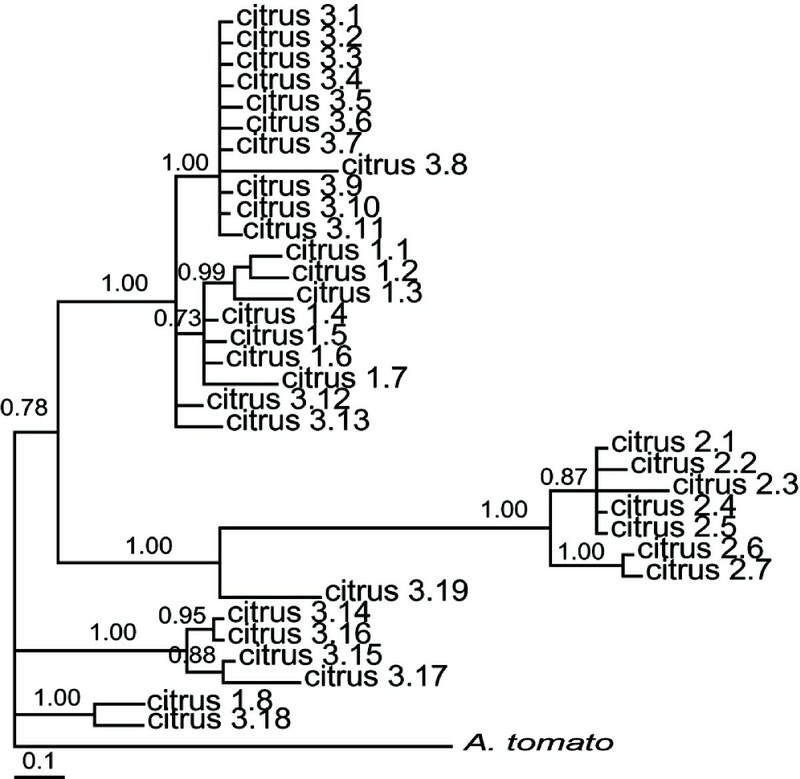 Only one well-supported clade was found, including all isolates from citrus 2. Locus OPA1-3, with 13 haplotypes, had the most phylogenetic resolution, resulting in six well-supported clades (Figure 4D). Among 503 sites, 75 sites (14.7%) were polymorphic. Of these, 55 (10.9%) were parsimony informative (Table 1). Of these clades, one corresponded to a terminal clade including all citrus 2 haplotypes, clearly separated from but sister to one citrus 1 haplotype, and polyphyletic relationships were observed in lineages 1 and 3 (Figures 4A-D). Bayesian phylogenies estimated for each locus, (A) endoPG , (B) OPA2-1, (C) Flank-F3, and (D) OPA1-3. Bold branches highlight nodes that were supported by 70% bootstrap values (maximum likelihood, 1000 replications) and 95 posterior probabilities. Numbers in parentheses represent the number of isolates of each haplotype. EndoPG haplotypes sampled from the citrus 1, citrus 2 and citrus 3 phylogenetic lineages are indicated by red circles, blue squares, and yellow stars, respectively. A total of six synonymous nucleotide changes were observed when comparing haplotypes of the citrus lineages 1 and 3 against haplotypes from citrus 2. Though only a portion of the CDS region was analyzed (427 out of 1137 bp), using the published rates for neutral gene substitution rate of 0.9 × 10−9 and 16.7 × 10−9 resulted in a divergence date of at least 5,400 thousand years before present. In the phylogenies from the concatenated and individual datasets, lineages citrus 1 and 3 were polyphyletic. Support for the citrus 2 lineage was found in most gene trees when GCPSR criteria was applied (Figure 4A-D). The citrus 1 and 3 lineages were only well-supported in the endoPG phylogeny and thus constituted a single, polyphyletic species when the other loci were considered. Congruence of tree topology was tested and statistically significant incongruence was detected for all pairwise comparisons of all loci with OPA1-3 (P = 0.00) using Shimodaira-Hasegawa tests (Table 2). All other pairwise comparisons were non-significant.The phylogeny generated from the concatenated dataset yielded four well-supported clades with topology similar to the endoPG phylogeny (Figure 5). The citrus 1 and 3 lineages were again polyphyletic, with individuals from each falling into three clades. However, lineage citrus 2 separated into one monophyletic well-supported (1.00 posterior probability) lineage.Little support for multiple species was obtained using the MDC approach. In the MDC-estimated species tree, all lineages clustered into one clade with high bi-partition frequency (over 98%) (Figure 6A). In contrast, *BEAST analyses revealed two well-supported species, citrus 2 and a second species comprising lineages citrus 1 and 3 (Figure 6B). aprobability of different topologies among 2000 bootstrapped datasets generated using RELL sampling. Bayesian phylogeny derived from the concatenated dataset with a total of 1672 nucleotides from four loci including the endo-polygalacturonase gene, SCAR markers OPA2-1 and OPA1-3, and one microsatellite flanking region AA-Flank-3. Node support in posterior probability is indicated for each node. Species tree estimations among a worldwide sample of citrus brown spot pathogen species groups using (A) the “minimize deep coalescent’ (MDC) approach, and a hierarchical Bayesian model as implemented in (B) *BEAST. Numbers above branches indicate node support as posterior probabilities. Coalescent-based approaches and ancestral recombination graphs were used to elucidate the evolutionary history of the citrus brown spot pathogen on a worldwide scale and quantitatively estimate the number of species causing this disease. The evolutionary history of these lineages showed patterns of incomplete lineage sorting and recombination as has been observed among other closely-related taxa [10, 14] and was hinted at in previous phylogenetic studies of Alternaria. Lineage sorting, recombination, and horizontal transfer  make phylogenetic analyses and species delimitation among small-spored Alternaria challenging [28, 36, 40]. In contrast to previous studies that described ten morphospecies causing Alternaria brown spot of citrus  we identified one or two species among three phylogenetic lineages using the “minimize deep coalescence” (MDC) and hierarchical Bayesian model approaches, respectively. Both methods failed to differentiate the citrus 1 and 3 lineages but the hierarchical Bayesian model method differentiated the citrus 2 lineage from citrus 1 and 3. Species boundaries between the morphospecies A. citriarbusti (citrus 1) and A. dumosa, A. turkisafria, A. perangusta and A. interrupta (citrus 3) were poorly supported by both methods. However, the GCPSR and *BEAST analyses separated the morphospecies A. tangelonis and A. colombiana (citrus 2) from citrus 1 and 3. The hypothesis that all host-specific toxin producing, small-spored Alternaria taxa infecting citrus as well as other hosts such as strawberry, Japanese pear, apple, and tomato represent sub-specific variants or “pathotypes” of A. alternata is not new . One of our analyses supported this hypothesis and all other analyses conclusively demonstrated that the number of taxa causing brown spot disease of citrus has been over-estimated using morphological criteria. Further study is required to determine if the citrus 2 lineage represents a distinct species, and if so, what these two species should be named. Alternaria alternata is an interesting model with which to study speciation in putatively asexual taxa. Asexual taxa do not easily fit within species concepts developed for sexual taxa [2, 4, 8, 74, 75]). In addition to being a well-recognized saprotroph, A. alternata infects a wide range of hosts, including citrus, pear, strawberry, and apple [73, 76, 77]. Pathogenic forms of A. alternata are thought to have radiated from a recent common saprophytic ancestor through the horizontal acquisition of pathogenicity factors [73, 78]. Isolates sampled for this study are considered representative of the “tangerine pathotype” [38, 79, 80] and these fungi produce host-specific ACT-toxins that are required for pathogenicity [74, 81]. ACT-toxins are structurally similar to the host-specific toxins produced by strawberry pathotype (AFT-toxins) and Japanese pear pathotype isolates (AKT-toxins)  and the genes controlling the biosynthesis of these toxins are homologous [81, 82] Connecting the three citrus lineages to the lineages of strawberry and Japanese pear pathotype isolates in future studies will allow polarization of the phylogeny of host-specific toxin-producing Alternaria and facilitate studies of toxin gene evolution and the evolution of pathogenicity. Assuming that the mutation rate for the endoPG gene is similar to other protein coding genes at approximately 0.9 × 10−9 to 16.7 × 10−9 mutations per site per year [71, 72, 83] the estimated time of divergence of the citrus 2 lineage and the citrus 1 and 3 lineages is at least 5, 400 years before present, and probably occurred much earlier. This date suggests that divergence of citrus 2 occurred long before the movement of citrus, and presumably its pathogens, from its putative center of origin in southeastern Asia less than 600 years ago . To date, only citrus 2 isolates have been isolated from North and South America, whereas the other lineages are found on several Old and New World continents. This suggests that independent introductions of each lineage may have occurred in different locations, presumably with the host. Using GCPSR criteria, many cryptic species have been identified, including several plant pathogenic fungi [85–87], human-infecting fungi [88–90], and an insect pathogen . Latin names have been assigned to some of these cryptic species [91–93]. As far as we are aware, this is the first report that compares the GCPSR method to other newly developed tree species estimation methods. Our results suggest that in the presence of divergent evolutionary histories, GCPSR will likely overestimate the number of species. Although no reports could be found comparing the GCPSR method with others, several studies have compared species tree estimates generated with *BEAST and/or MDC to concatenated results. It is now well-documented that concatenated data can produce well-supported phylogenies that are inconsistent with the true species tree [13, 94–96]. Furthermore, Belfiore et al. developed species trees using concatenation and BEST (Bayesian Estimation of Species Tree) for pocket gophers of the genus Thomomys and found that the concatenated tree estimated from seven loci was over-resolved whereas fewer species were supported in the phylogeny estimated using BEST . This result is similar to what we observed in this study with A. alternata. Further, Eckert and Carstens  tested the accuracy of concatenation and MDC generated species trees using simulated datasets in the presence of gene flow. As the level of gene flow increased the probability of identifying the true species using concatenation dropped to zero, although this value only decreased to 74% using MDC . We found similar results, with the *BEAST and concatenated trees having similar topologies, but with node support varying widely. Our results suggest that species tree estimation methods that account for gene tree uncertainty among loci with diverged histories, with signals of lineage sorting and recombination may result in fewer well-supported species than concatenation, especially among closely related fungal taxa. Two of the loci we employed in this study (Flank-F3 and OPA1-3) revealed strong evidence for a history of recombination. Asexual Alternaria species are thought to be derived from sexual ancestors , as has been suggested for other asexual ascomycetes , and one species A. infectoria has been connected to a Lewia teleomorph . Although time scales for our ancestral recombination graphs (ARG) are not possible, the ARG for Flank-F3 showed three possible recombination events where citrus 2 haplotypes are possibly derived from citrus lineages 1 and 3. It is difficult to date these putative recombination events and to know if these events are the result of historic or current sexual or asexual recombination. Signatures of recombination were found in the citrus 1 lineage in an Alternaria brown spot fungus population in Florida  but the mechanism of this recombination is not known. Alternaria may be able to recombine through parasexual and/or sexual means , which concurs with the findings that mating type genes in A. alternata are expressed  and under strong purifying selection . Further studies will be needed to determine if Alternaria alternata sensu lato is capable of forming a sexual stage than has heretofore been overlooked. If so, results from our ARG may represent contemporary rather than historical recombination, although dating recombination events in the ARG is not possible. Species delimitation is important for the study of the evolution of pathogenicity and the emergence of infectious diseases. Further, the delimitation of species also plays a critical role in global biosecurity by providing guidelines for restrictions on the movement of plant pathogens among countries which has national and international significance [100, 101]. The threat of movement of introduced pathogens around the world has resulted in the quarantine of many crops or the rejection of exported crops. Incorrectly naming a new species or wrongly identifying a species can result in significant economic losses . In 2001–2002, shipments of Li Ya pear imported from China were rejected because of signs of Alternaria spp. infection, which also occurred in Australia, New Zealand, and United Kingdom. Two related species, A. alternata and A. gaisen, were included in a pest risk assessment and further research showed that isolates sampled from Li Ya pear were morphologically distinct and given a new name, A. yaliinficiens. Our results indicate that citrus brown spot is caused by a maximum of two species of Alternaria, and that taxonomic revision of Alternaria infecting citrus, based on congruent morphological and genetic analyses, is needed. One of these species (encompassing lineages citrus 1 and citrus 3) is found worldwide but the second (lineage citrus 2) species has only been found in the Americas. It is not yet known if phenotypic differences in aggressiveness, host range, or growth rates exist between these species, but if so, limiting the movement of the citrus 2 species into new countries might be warranted. This study highlights the need for the use of these new methods to accurately identify closely related, morphologically indistinguishable species that are important in agriculture and potentially of regulatory interest. The data sets supporting the results of this article are available in GenBank under accession numbers KF699389-KF699527. We thank Dr. Marion Andrew, Dr. Francesca Rotondo and Kalyn A. Thomas for sequencing assistance. We also thank Dr. Zaid Abdo for critically reading and for comments that vastly improved this manuscript, and Dr. Hilal Özkilinç for fruitful discussions. This research was funded by NSF DEB0918668. JES and TLP conceived of the study. JES carried out molecular genetic studies and bioinformatics, and analyses. JES, TLP, LPT, CML, and BMP wrote and edited the manuscript. All authors read and approved the final manuscript.